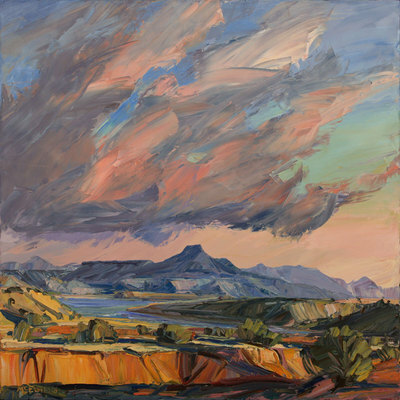 Louisa McElwain, Ghost Ranch, Late Afternoon, Oil on Canvas, 24" x 64"
McElwain has spent the last 22 years painting the beauty of northern New Mexico. While her earlier work focused on the geological and natural feature of this area, her new work is more about the rhythm of the season, and her own connection to the spiritual aspect of the land. 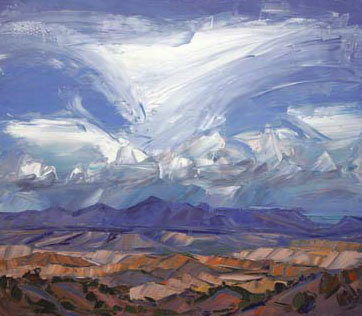 Louisa McElwain, Shining Cliffs, Ghost Ranch, Oil on Canvas, 12 " x 72 "
“My deepened relationship with a few beloved places continues to entice me to paint increasingly evanescent events of nature, to take greater leaps into larger canvases, surrendering to the inquiry, and to paint with ever more trust and joy,” says McElwain. Louisa McElwain, Amazing Grace, Oil on Canvas, 54" x 54"
Sometimes, this relationship carries so far that McElwain wants to put actual pieces of the environment into her paintings. Louisa McElwain, Fanfare, Oil on Canvas, 24" x 64"
This all adds to the idea of place that McElwain is exploring so deeply in her work. This relates to the place itself as well as the idea and feeling of it. 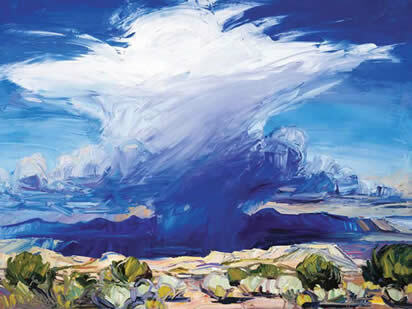 Louisa McElwain, Desert Rain God, Oil on Canvas, 54" x 72 "